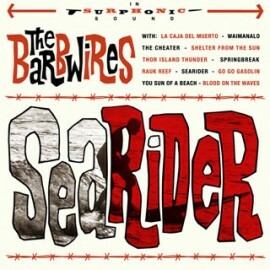 The Barbwires - Searider LP 180 Gram - BACK IN STOCK!!! Limited quantity! Re-release on 180 gram vinyl in gatefold cover. Remastered for vinyl and with brand new liner-notes by Mr. John Blair. Searider was originally released on CD in 2008 on Wild Records and is the best surf album of the XXI Century! Simply EPIC cross-breeding of surf and exotica using brass, vibes, pedal steel, and Theremin. "The Barbires' goal was to make a guitar-driven surf-instrumental album in the spirit of a sixties' Brian Wilson production with strig arrangements by Jack Nitzsche," says John Blair on the LP liner notes. The CD is sold-out and now you can get your copy as a deluxe limited edition vinyl LP.